This is a Clansman PRC-319 Dipole Balun. 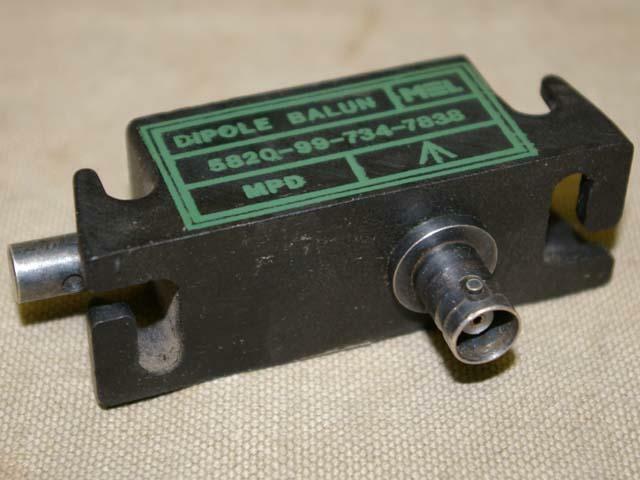 A Balun is a device that interfaces or matches the balanced antenna input of a radio to an unbalanced antenna load and is mainly connected to HF man-pack radios connected to a dipole wire antenna. The word Balun is derived from the words of BALanced to UNbalanced. A common example of where a Balun would be needed is at the feed point of a dipole antenna when a coaxial antenna wire from a radio is used. If a Balun is not used then the radios performance would be affected. NSN: 5820-99-734-7838. Supplied in good condition.